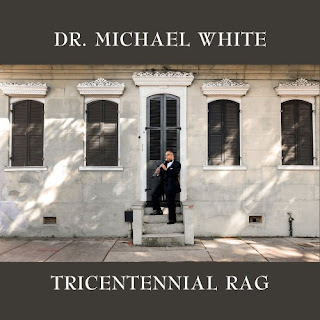 Dr. Michael White is a multifaceted, multi-talented New Orleans-based musician who hasn't gotten nearly enough exposure outside of his native Crescent City. A musicologist, jazz historian, educator, clarinet player, and bandleader, White and his band make an annual trip to New York's Village Vanguard jazz club to perform on and around New Year's Eve. But owing to his responsibilities as a professor at Xavier University, he and his band don't get out of town that much. White began playing clarinet in classical music settings, but eventually, the jazz bug overtook him and he began performing around New Orleans with various brass bands. Most notably, White hooked up with Doc Paulin, who led a ten-piece brass band. To offset the feast or famine nature of his income as a musician, he began teaching Spanish at Xavier University in 1980. In recent years, he's been teaching New Orleans music and culture under an endowed chair at Xavier. While the blues is fundamental to everything White does as a musician, the more he learns about New Orleans music and other music of the American south, the more he likes to push himself and his bandmates in different directions. It is White's crystal-clear-toned clarinet playing that can be heard on Wynton Marsalis' critically hailed 1989 release, The Majesty of the Blues (Columbia Records). More recently, White worked with Marsalis, the artistic director for jazz at the Lincoln Center in New York, on A Tribute to Jelly Roll Morton, a series of concerts that were performed there. White also served as musical director for concert tributes to King Oliver and Sidney Bechet that were collaborations with Marsalis and the Lincoln Center Jazz Orchestra. White began playing clarinet as a youngster, but didn't make his professional debut until he was in his late teens with Paulin's brass band. He cites as primary influences many New Orleans clarinet players: Sidney Bechet, Johnny Dodds, Barney Bigard, Paul Barnes, Willie Humphrey, and George Lewis. Raised on classic R&B and early rock & roll, he became aware of Benny Goodman while studying clarinet in his teens, but was more interested in the long clarinet tradition in New Orleans. White had a musical revelation in 1975 when he first put a needle down on a recording by clarinetist George Lewis. He proceeded to wear out the grooves on the record, and listened to it for days on end. Later he learned that one of his relatives was on the Lewis recording. He formed his first group, the Original Liberty Jazz Band, in 1981. He continues to lead that band as well as two smaller groups, the Liberty Brass Band and the Michael White Quartet. White has recorded two critically acclaimed albums for the New Orleans-based Basin Street Records label, Dancing in the Sky (2004) and Jazz from the Soul of New Orleans (2002). Both ventures freely mix blues tunes with more traditional sounding New Orleans jazz numbers, and both will appeal to fans of blues and jazz. An earlier release, A Song for George Lewis, was released in 2000, also for Basin Street. With Antilles Records, White released New Year's Eve Live at the Village Vanguard and Crescent City Serenade, both in the '90s.